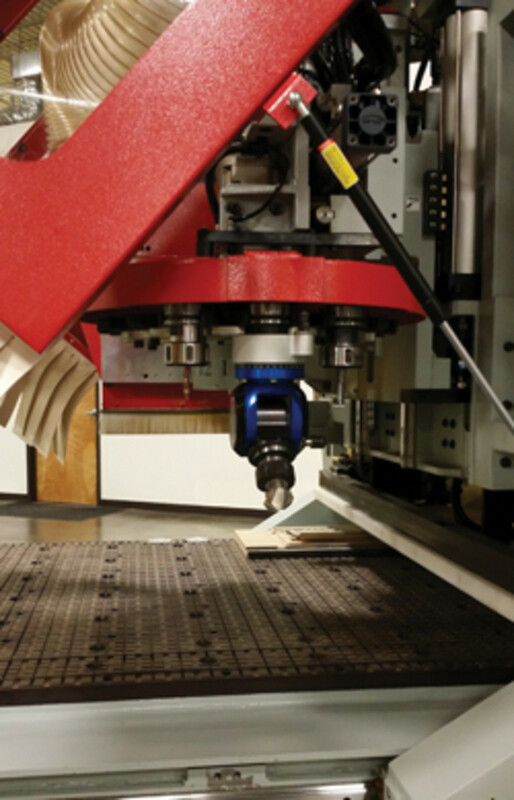 The addition of an aggregate head to a standard CNC router allows a woodworker to mount more than one tool at the same time or to work at angles other than the standard spindle — or indeed do both simultaneously. 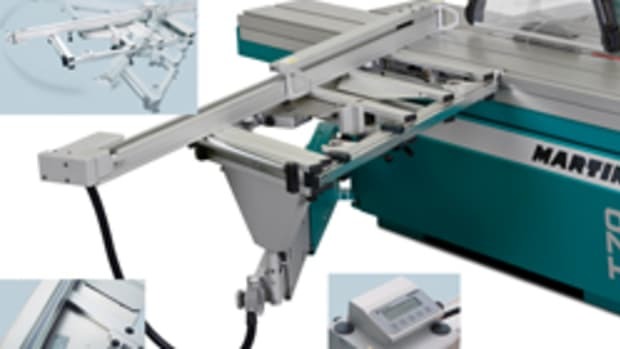 Adding a head that can accommodate two, three or even four tools without having to stop and change for each function can dramatically speed up routing and sawing operations. And working at variable angles lets the CNC tool create chamfers, reach into tight corners and new places, and cut some interesting profiles and parts. Benz Inc. (benz-inc.com) is a leader in this field and the company just announced two new adjustable-angle head systems, the Flex 5 and Flex 5 Plus, both of which use oil-bath lubrication. The typical output connections on these heads will combine a sawblade flange with a flush-mount ER25 nut and collet system. With a maximum input speed of 15,000 rpm and a 1-to-1 gear ratio, these heads are ideally suited for sawing, drilling and routing. What’s different here is that they can use the movement of the C-axis (by program) to change the output angle in seconds. An onboard braking system locks the output angle in the desired position and, once locked, the C-axis can be used to rotate the aggregate head within the horizontal plane. The two new angle heads provide a sawing swivel range from 0 to 90 degrees and a routing swivel range from 0 to 100 degrees. 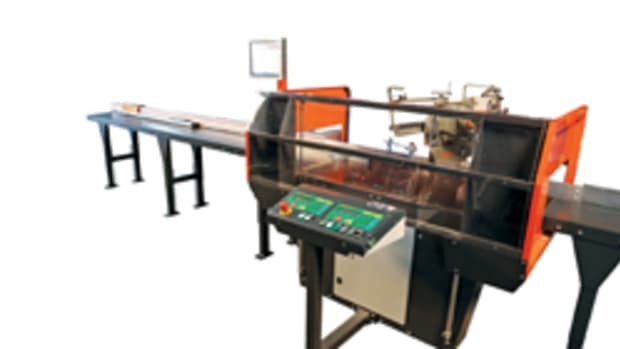 An optional automatic tool changer, offering 15-second tool changes with output connections, is also available. 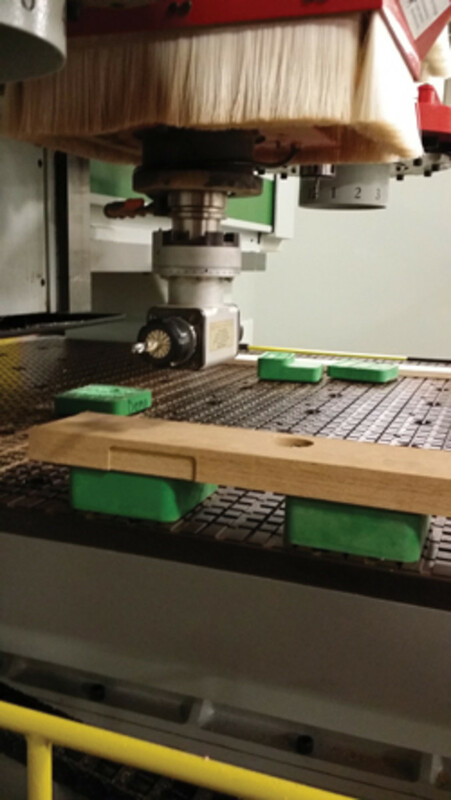 Unfortunately, neither head can be retrofitted, so woodshops interested in outfitting a CNC router with either one should contact their OEM machine builder to ask for additional details and pricing. Benz also has a relatively new turbo floating aggregate head that features integrated dust control. A 360-degree integral dust hood directs chips straight up and into the collector and the head requires no C axis, so there’s no need to steer the unit because the dust hood is concentric. Depth of cut is easy to adjust and the head has large, easy-to-read gradations. It’s made for all brands of machines. 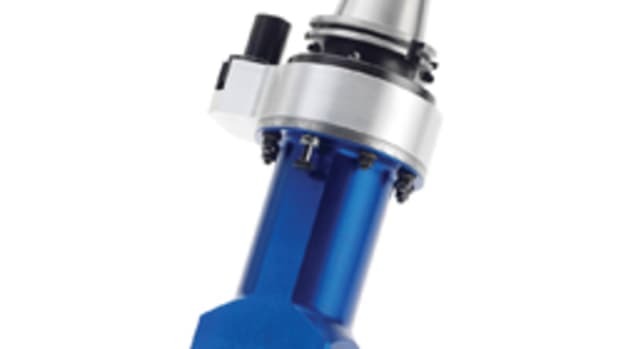 Colombo Spindles (colombospindles.com) has an extensive offering of aggregate heads, running the gamut from simple right-angle units to twin heads and variable angle collets and arbors. And Colombo repairs and rebuilds its own spindles using only new OEM parts and specifications direct from the Giordano Colombo factory in Italy. Precision Drive Systems (pdsspindles.com) is the exclusive U.S. distributor of Hitco (hitco.com) aggregate heads. It can offer shops a variety of different configurations, most of which are supplied with HSK-F63 or ISO 30 connections and can be used via different C-Axis connections. The range is impressive. Some aggregate heads are relatively specific in terms of tasking. For example, the lock-recess oscillating head from Technics USA (techniksusa.com) swivels from side to side in an arc as it plows a large mortise for a lock in a standard entry door. This action accomplishes the task about four times faster than a standard head and there’s a link to a video on the website that’s worth watching. Even though it has been around for four or five years, the head is so innovative that it won an IWF Challengers Award when it came out. The company also partners with reputable distributors, one of which is Integra Precision Tooling (ipgandm.com). HSD USA Inc. has a well-illustrated, 150-page, downloadable catalog of aggregate heads at hsdusa.com. Eltool Corp. (eltool.com) offers “coolant-driven” angle heads under the brand name Titespot. 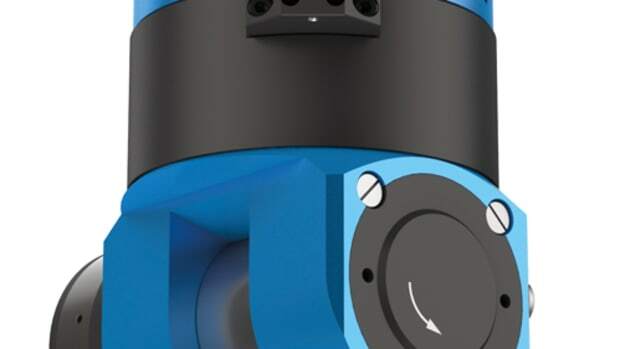 The company describes them as a cost-effective alternative to mechanically driven heads, particularly where machining at multiple positions and/or in small bores or cavities is required. 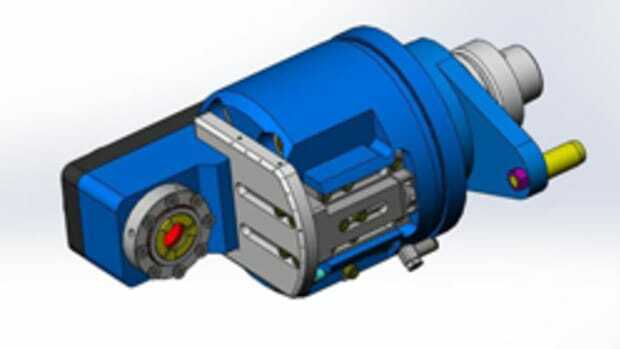 Spindle rotation is not required to power them, so that means the spindle can function as an indexer, allowing multi-position machining with one head and one setup. Unlike conventional, mechanically driven aggregates, Titespot heads are small so they can machine close to walls and other obstructions. And because they don’t depend on bearings for housing support, any “play” is eliminated. They’re simple to install because they load directly from the tool changer and no stop blocks are required. They are also efficient because coolant flowing through the head eliminates heat buildup. 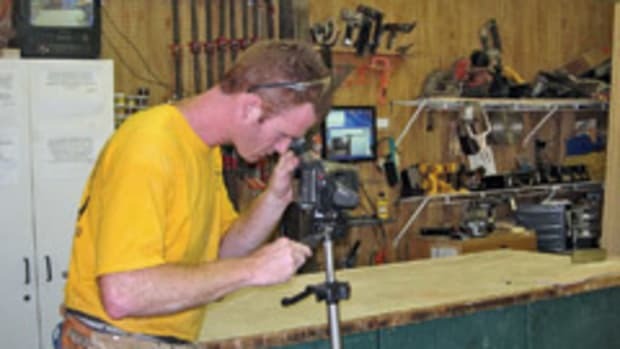 T-Tool USA is the U.S. distributor for its German parent, T-Tool Precision GmbH. The company offers a full line of CNC aggregates in both ISO-30 and HSK-63F taper forms. 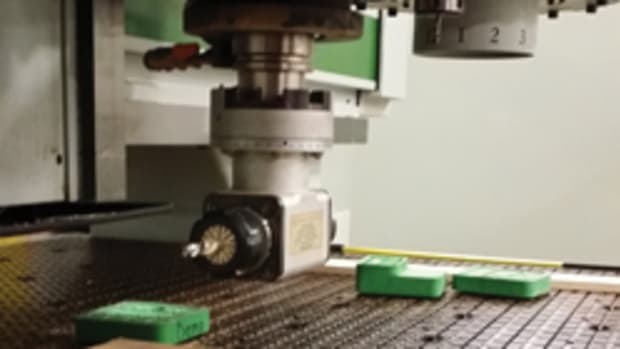 Available in either grease or oil-bath, the company’s Italian manufactured aggregates are available for the most popular CNC routers on the market. T-Tool now has a link to its latest aggregate head catalog at t-toolusa.com. For woodshops that need to explore the world of aggregates, industry stalwart GDP Guhdo has a complete guide on guhdo.com. There are, of course, many other sites online that explain the mysteries of this technology, but few do such a nice job. And there are many other aggregate head suppliers, too. One of the more familiar is Koma (komaprecision.com), which is perhaps better known for metal-milling CNC heads. Koma just added half a dozen new Alberti angle heads to its product lineup. And the Spanish company Madaula S.A. (online at madaula.com) is one of the older names in machine head technologies. Another worldwide supplier is Lyndex-Nikken (lyndexnikken.com). Atemag (atemag.de) engineers, builds and markets aggregates and accessories for CNC machines under three line names — Smart (light duty); Function (high performance in continuous operation) and Ultra (for extreme applications in continuous operation and for use with critical materials and highest loads). Atemag also does some custom designing and building of heads. As you are shopping, check the various websites for repair facilities. Some of the best choices are those that service their own brands in-house, as they will almost always have parts and expertise on hand that can minimize downtime in the woodshop. And getting a loaner is also a possibility, so keep that in mind. There are also some very reputable repair facilities that cross product lines and work on spindles from a variety of manufacturers. Among them are Atlanta Precision Spindles (atlantaprecisionspindles.com), Gilman (gilmanprecision.com), GTI (gtispindle.com), Northern Services in North Dakota (northsi.com), and Ekstrom-Carlson (ekstromcarlson.com). This latter is a tooling manufacturer that, in addition to manufacturing new spindle motors to original Ekstrom Carlson specs, can upgrade and repair all makes and models of spindle heads and motors including brands such as Perske, HSD, Colombo, Omlat, Gamfior, Fimec and more.